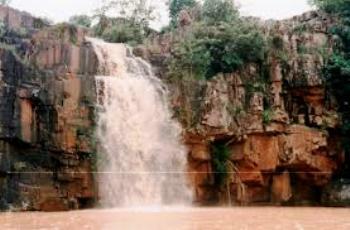 Handibhanga waterfall is one of the famous waterfalls in Keonjhar district, famous for its natural beauty. Set amidst rich natural beauty, the spectacular Handibhanga waterfalls splashes down from a height of 30 m. Due to the eye catching natural beauty of this place it has attracted large number of tourists over time. This ideal picnic spot is in Bahalda Village, 16 km from Baripada and it is situated at a distance of 100 km from Kendujhargarh. This can make you to feel peace at least for a while and will take you to the other world. Just come once and feel the beauty. The salubrious weather coupled with the picturesque landscape of Handibhanga provides the visitors to experience the heavenly bliss of Mother Nature and rejuvenate them with renewed energy and vigor. The best time to visit the Hnadibhanga fall is during the period from October to March. Handibhanga waterfalls is situated at Bahalda village in the district of Mayurbhanj, at a distance of about 16 km from Baripada and 70 km from Keonjhar. It is a spectacular waterfall, falling from a height of about 30 mtrs. The waterfall is set amidst natural beauty of forest and mountains. The place is also a well known picnic spot. Several of picnickers visit this place every year during the picnic seasons. Another famous picnic spot near this place is People who come to Joda also visit the sightseeing spot of the Handibhanga waterfall. It is a must to visit place. Handibhanga waterfall can be reached through road from Keonjhar, Baripada, Joda and Palaspanga. People prefer to visit this place by private or hired vehicles.